Heat oven to 350°F. Spray cookie sheet with cooking spray. Separate dough into 5 rolls. Spray thin, serrated knife with cooking spray. On work surface, slice each roll horizontally in half, making 10 rolls (respray knife and reshape dough if necessary). Wrap 1 roll around each sausage link (see photo); secure with toothpick. Bake, toothpick side down, 12 to 15 minutes or until sausage links are hot and roll is light golden brown. Cool 5 minutes. Meanwhile, in small bowl, mix icing and syrup until blended. Microwave on Medium (50%) 20 seconds or until warm. 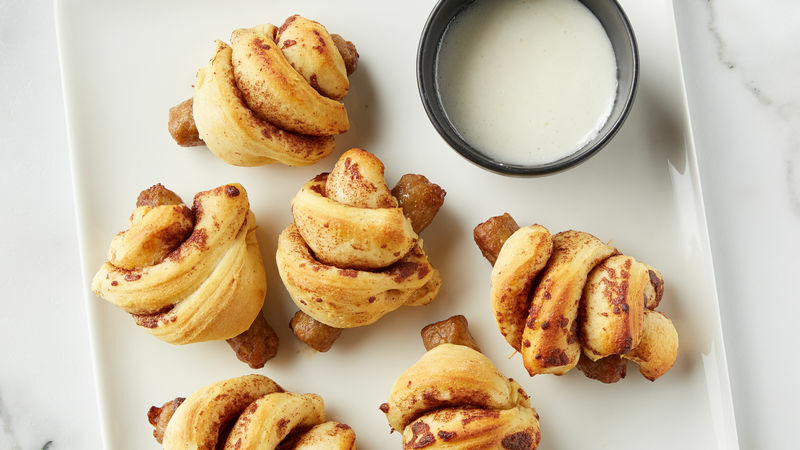 Serve with warm cinnamon roll-wrapped sausages. Tip: For easier slicing, place rolls on plate and freeze 15 minutes or until dough is firm enough to slice.